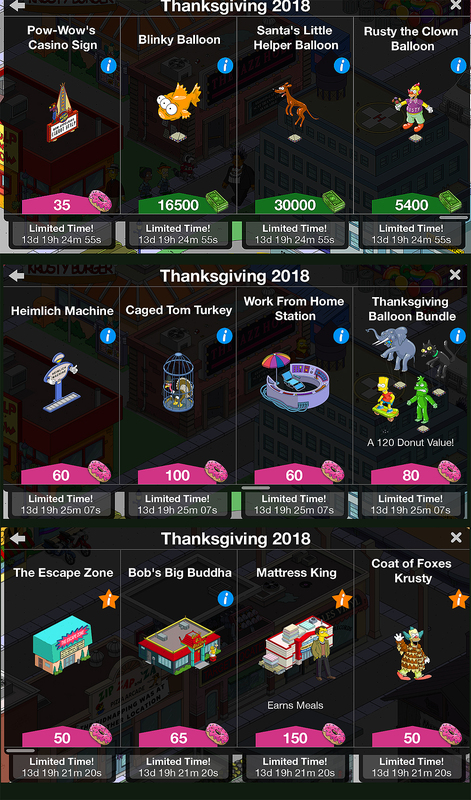 Thankgiving 2018 has hit the store! Here are the basics. Phew! We got a nice long break between the end of Halloween and the start of this new Mini-Event of a whole…let’s see…4 or 5 hours? Nice. Thanks EA. But, at least we are staying ahead of the seasons, and not mixing them all up like they do at Costco and Target. Thanksgiving is upon us! (except don’t start thawing the turkey yet…you’ll get botulism). 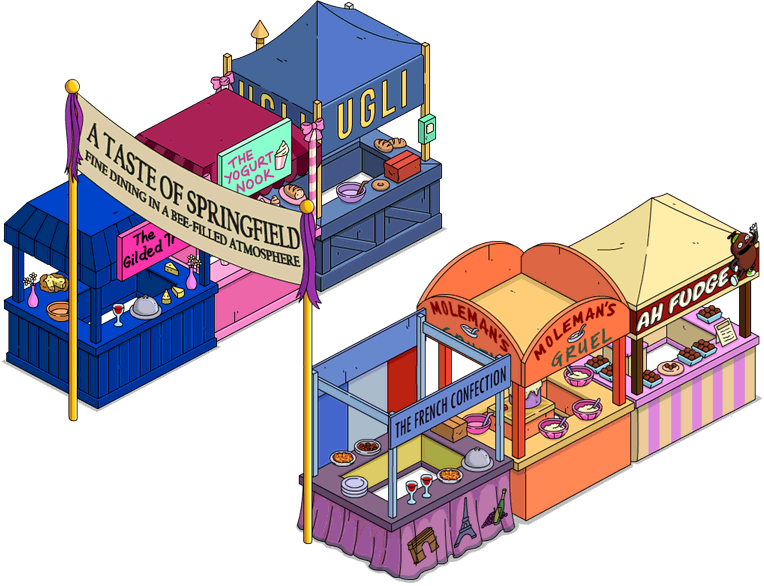 It looks like this event is going to be “Moe-Centric” which makes me thankful that it isn’t another Homer-Centric event! Not that I have an ax to grind with Homer, but let’s face it…he always steals the drumsticks before anyone else can get one. Here are the basics that we know about so far. Alissa will do a much more complete version when she returns from Disneyworld tonight! 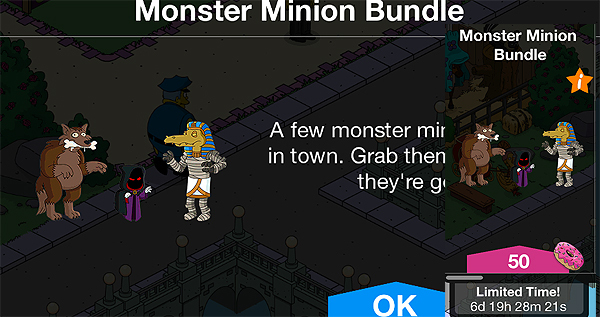 OH…and if you want some of the minions wandering around your town…you can get them for 50 donuts. I don’t….so I didn’t. However, after you complete the 4 hour task (which I rushed), the Moe-Centric part starts. So…yes…kinda random. But, the storyline is fun, and the dialogue is funny. So yes…right away…you are faced with the decision to buy a Premium Character to help you earn faster. I did. And the WareHouse is HUGE! 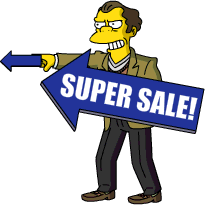 There are loads and loads of Premium Offerings…it’s almost as if they jumped the gun for Black Friday! (Like Costco and Target). there is also an even larger ton (as in a Ton-O-Stuff) from T-Givings Past. It will depend on what you have already bought/own… but there are a handful of options, some of which give you pretty large XP bonuses. So…pretty good for old decorations. In short…this event is short…ending on November 28th. Just in time for the Christmas/Holiday/Winter Spectacular! Alissa will be back in time to do some more detailed analysis…as well as a few SIBs. So, be patient. 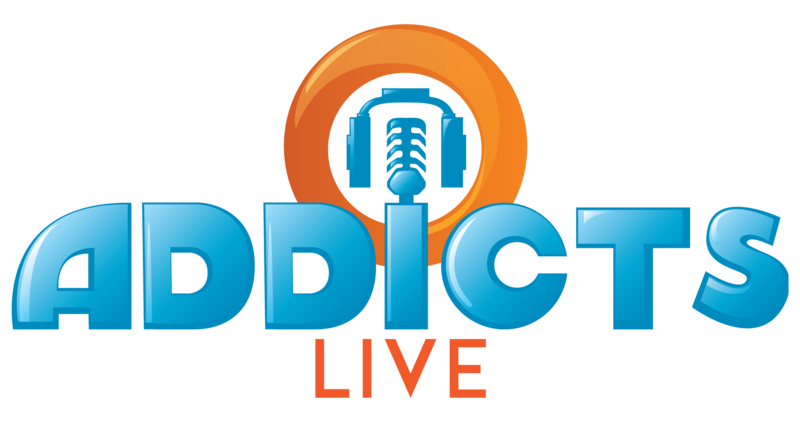 She is fresh from the Disney Experience…with a new baby and a toddler! Talk about BRAVE!! Have fun. Be Thankful. Keep on Grinding! And remember…there are more accidents with Deep Fried Turkeys than any other cooked food. So BE CAREFUL!! 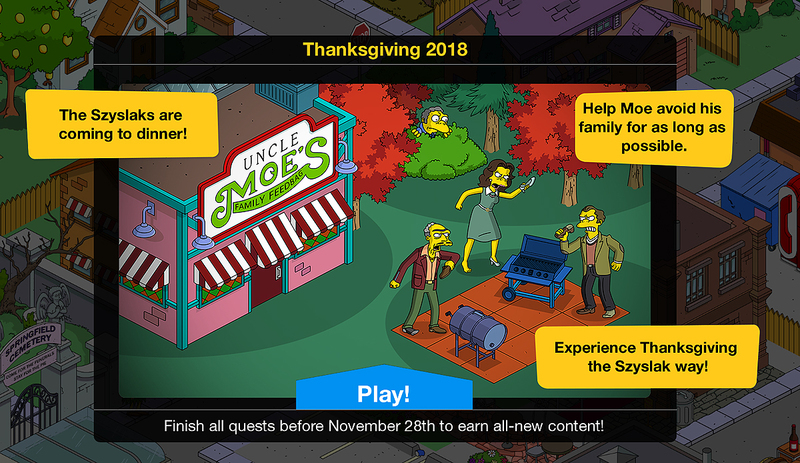 This entry was posted in Tapped Out, Thanksgiving 2018 and tagged Minnie Szyslack, Tapped Out Tips and Tricks, Thanksgiving 2018 Event, The Simpsons, The Simpsons Tapped Out, TSTO, TSTO Addicts, TSTO Community, TSTO Szyslak Family, TSTO Thanksgiving 2018, TSTO Tips and Tricks. Bookmark the permalink. 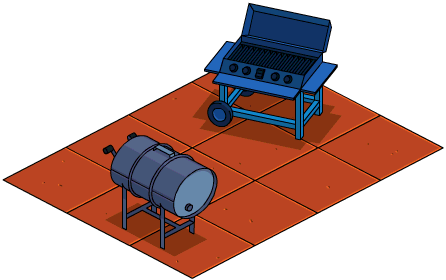 As much as I want to pick up some new ones, after buying Marge’s mom, I’m going to save for the next event. I took a year off from tapping, but the boxes have helped me get some of the stuff I missed. Hoping the holiday event boxes don’t disappoint. 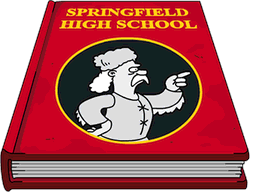 I want Claus Co (got screwed by the wheel) and Santa Homer. 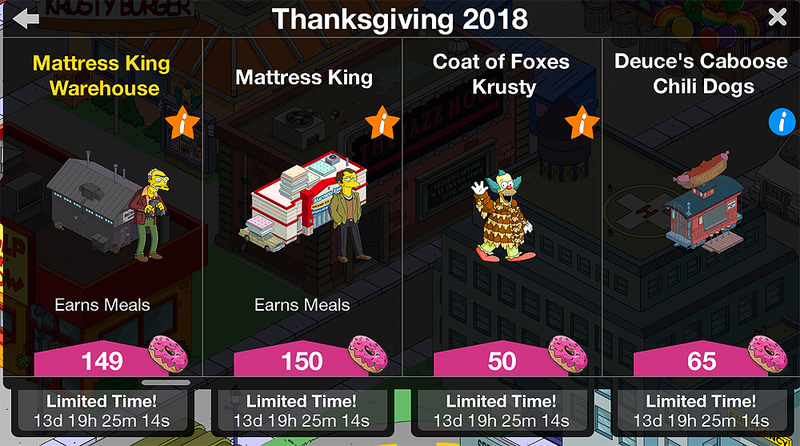 Does anyone know if the Thanksgiving balloon bundle comes with a bonus to xp? 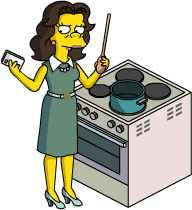 Had to buy mdm Bouvier as soon as she was available. Not sure about mattress king or warehouse. Will have to wait for SIB. Would be most persuaded, i think, if they have fun animated jobs since i don’t know their episodes. 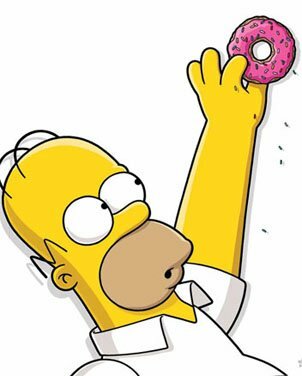 Thinking about getting obese Homer and work from home station. That was such a wonderful classic episode. Not sure yet though. 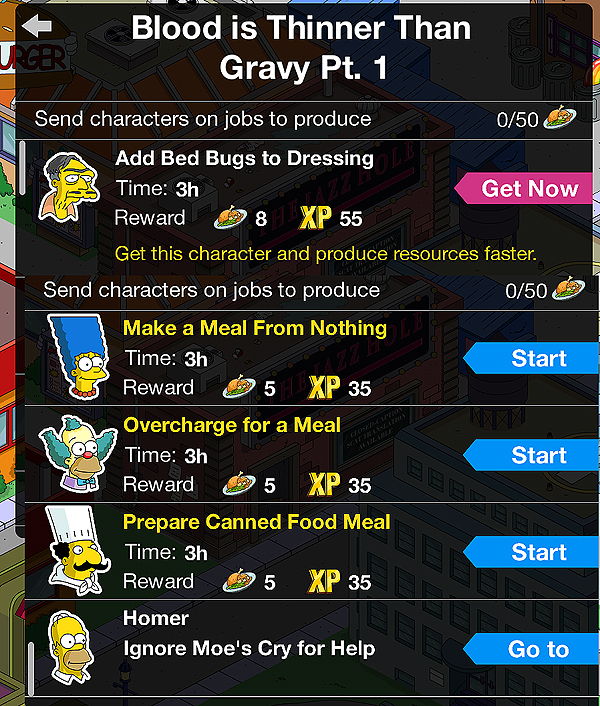 Most interested in things that offer premium jobs to non- premium characters or items that give bonus xp. Probably will pass on the new buildings. It’s rather nice not being anywhere near the item limit. Rarely hampered by glitches, able to decorate without space concerns. Do want to keep building up my bonus xp and in game cash though for the KEM farm. Has the Black Friday/thanksgiving mystery boxes content been pretty much the same over the years, or do they change it up? Just trying to figure out what to expect, so i can plan my purchases. There’s some variety every year. I noticed that Luann and Belle are suddenly missing from the store, so they must be coming up for sale. They only did mystery boxes last year. First time. And it was awesome! Cant wait. I’ve been saving all year. 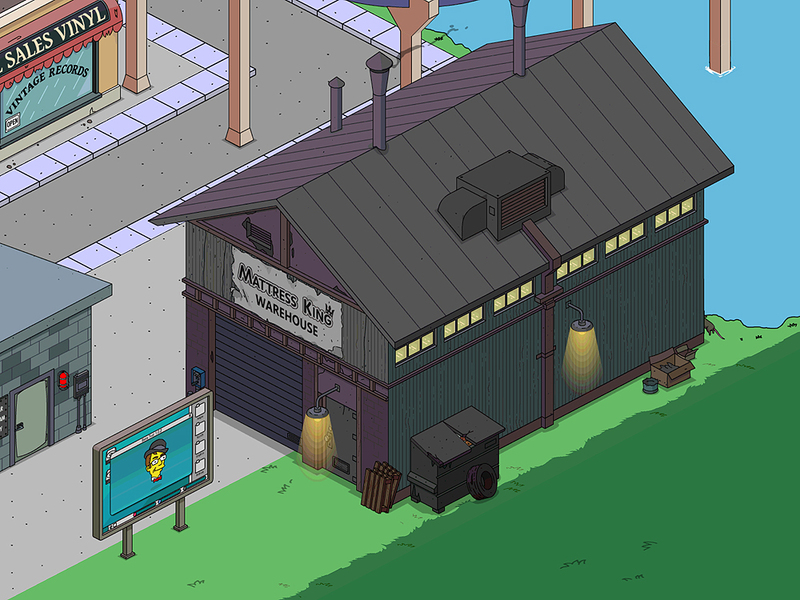 Looks like Rancho Relaxo and Santa’s Little Helper will NOT be in the mystery box. Everything else in my character bin is gone. The Reverend’s kid may be in the box this year! I was hoping that the monster minions would be actual characters like the tourists that you could send on various tasks to change into their monster forms. Also, if EA is going to be so stingy with the land tokens, then I may run out room to keep playing.